"Microgame" is an ambiguous term in the tabletop gaming world. It's kind of an "I know it when I see it" thing - Love Letter (16 cards) is definitely a microgame, and so is Tiny Epic Kingdoms (lots and lots of cubes and boards and pieces), but I don't often hear folks call Coup a microgame, even though it comes in the same size box as TEK and has fewer cards than Love Letter (albeit with some chips and other little boards). I admit confusion at what constitutes "micro", but I still use the word to describe those things that definitely are a game in a small package. Not all microgames are created equal, and in a Kickstarter-led world of reducing components and size and weight to reduce shipping and printing costs, there's a whole host of games that are playable, but fit squarely in the "flash in the pan" variety. Not so with Eminent Domain: Microcosm. At 34 cards and about a playmat's worth of table presence, ED:M could absolutely be called a microgame, but I'd rather call it a great game. Just like its macro predecessor, Eminent Domain, there's nothing micro about the depth of choices and the various paths to victory that emerge during play. The experience lives up to everything I expect from larger, deeper two player games like Patchwork and Akrotiri, and for this I say it's one of my favorite games of the year! 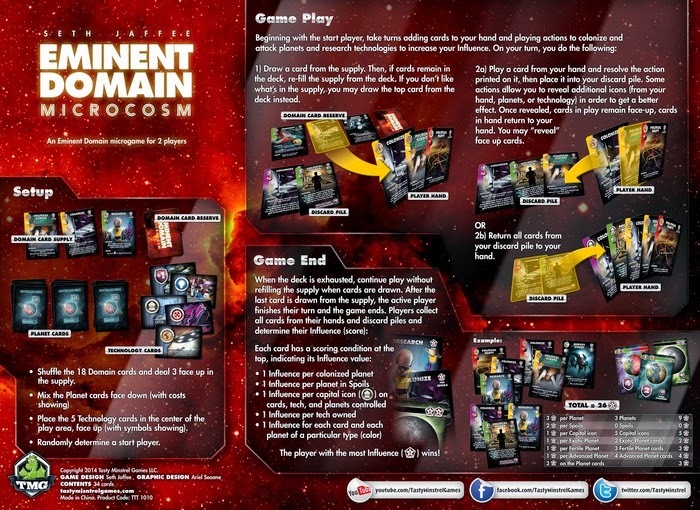 In Eminent Domain: Microcosm, players compete to score points through researching technologies, acquiring and conquering colonies, and collecting cards. 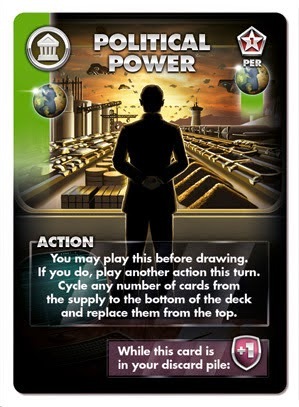 There are eighteen action cards in the game, each worth VP at the end of the game based on things like the number of tech cards a player has, the number of colonies, conquered worlds, matching planets and cards, or political influence. Players take turns drawing and playing cards, and after nine rounds of play, each player will end with nine cards, each worth some number of points, and perhaps some colonies and conquered worlds worth a few points as well. The player with the most points at the end of the game is the winner! Although you definitely don't have to have played the original Eminent Domain to understand and enjoy ED:M, I think it helps to have the theme and mechanics in mind when talking about it. I've previously reviewed Eminent Domain (a game I adore), and I encourage the reader to check it out. A few cards have an ability that's active when the card is in the player's discard pile. That's it. This happens nine times per player, then boom - the game is over. What's so deep or interesting about that? As it turns out, the choice of which action cards to take is often a tough one. The distribution of victory point conditions is interesting - there are four cards each that score points based on how many tech cards you have, how many colonies you have, how many "spoils" (conquered worlds" you have, and one each for each of the four colors of planets/cards. There are two other cards that don't have any scoring characteristics, and only score points based on how many Capitol symbols you have. Most of these cards also have the aforementioned symbols that let you chain or improve actions, as well as the actions that you take during the game to take colonies, spoils, tech cards, and occasionally screw with your opponent. That makes evaluating whether a card is good for you hard - especially early in the game, when it isn't obvious yet what grand strategy will be open and most profitable for you. One of my favorite things to do in gaming is to make decisions with incomplete information from among limited choices. Drafting and auction games often do this very well, and Microcosm has that same feeling - players are taking turns drafting cards from a center row that constantly replenishes until the game ends. Well-laid plans often go unfulfilled because of the luck of the draw from the deck, or because the opponent recognizes an advantage and plays to mitigate it. This kind of give-and-take makes the relative value of scoring cards change during the game, which leads to more interesting decisions, which makes me giddy. It's tough to know exactly how strong a given strategy will be when you don't know what your opponent is planning, and the varying strata of planets that can be colonized and attacked can also influence your decisions as the game progresses. 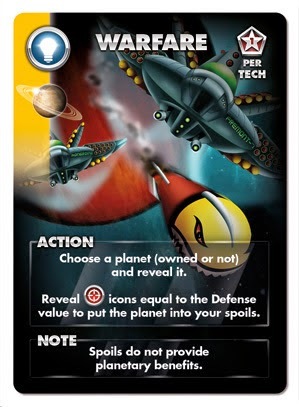 Planets are separated into three stacks based on their colonize values, and have variable defense stats within each strata - meaning it's possible to attack a planet with a warfare card and fail to claim it, or even to attack an opponent's colony (tougher to do once colonized because of additional defense granted to colonies) and fail to claim it. The risk of failure makes the Warfare strategy a tough sell, but unlike colonies and tech cards, spoils can't be taken from you after they're claimed. They're a safe bet, and as a result, a little less powerful in comparison with other scoring conditions. Colonies - tougher when they're mine! It took me three full games before I felt like I was making choices with grand strategy in mind, and that's a welcome change from many of the Kickstarter games I've backed, micro-definition aside. It's nice to feel challenged by a game through multiple plays, and to run the risk of losing to a new player even when I'm the more experienced planeteer in the conflict because my choices don't pan out. The five tech cards offer players bonuses to the various actions in the game, and also offer points if players have the right victory conditions. These tech cards feel like the most successful abstraction - in game design, the reduction of a complicated thing to its core aspects for use in something else while maintaining its "feel" - of the game, and create a neat sense of "tug-of-war" between players, both because of their bonuses (occasionally very important) and because of their scoring power (almost always important). It's just deep enough to be interesting without taking away from the core pressure of the game, which is deciding which action cards to take and when to play them. The rules are contained completely in a single page, which is an impressive act of micro-sizing, but a little disappointing because of a lack of visual examples of game play and some of the pesky situations that come up. We've been able to extrapolate what seem like reasonable rulings in the few strange situations we've had, so two thumbs up to the technical writers at Tasty Minstrel Games for making efficient use of space. 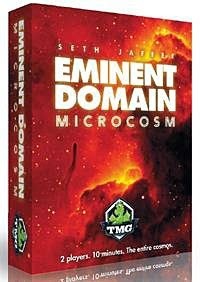 I've given Eminent Domain: Microcosm a 9/10 rating at BoardGameGeek, a rating that I reserve for games I'm very impressed with, and that leave me immediately wanting to play again. Typically, those are games like Ticket to Ride, 7 Wonders, Tichu, and Comic Encounter - but it's ok for ED:M to slip in here with these giants, because it doesn't "feel" like a microgame at all. For $10 MSRP, go pick it up and play it with your best pal, and let me know if you beat my high score of 42 points!